What if we told you that with Enalyzer’s surveys and reports you can implement and track your employee experience in a cost-effective way? Before we get into it, let’s talk about why it’s important. Companies with a strong base of loyal customers have one thing in common: highly engaged employees. If your employees are engaged, they will perform at every level, delivering a better product and customer service to your customers. In short: customer experience is a direct result of your employee experience. That’s it, we just thought you should know that our job here is done. Thank you and goodnight! Just kidding. Employee engagement is becoming increasingly complex and there’s a need for new tools and processes in order to improve it. Unfortunately, there’s sometimes a discrepancy between employee’s wants and needs and HR objectives. Many HR leaders have not made employee experience a priority and even when they do, they do not have the tools available to execute it. To throw salt on the wound, the job isn’t getting any easier. Organizations are quickly switching to team-based structures, making the employee experience more important but also more complex for HR to monitor and improve. Sounds complicated but it is far from impossible. Actually, by connecting Enalyzer with the multitude of tools available today, you can create an engaging environment for everyone. Introducing the perfect combo: Enalyzer, Zapier, and 1000+ apps. Enalyzer is an excellent tool for collecting and analyzing data, helping you know better and make better decisions. Your employee experience should meet your employees’ wants and needs and you can’t do that without collecting and analyzing their feedback. Zapier is a web automation tool that connects Enalyzer with 1000+ apps. This means you can connect Enalyzer with the apps you and your employees use every day and automize everything. Win meet win. The employee lifecycle (ELC) is one of the most used HR models and can be used to identify the different stages in an employee’s career to help guide management. 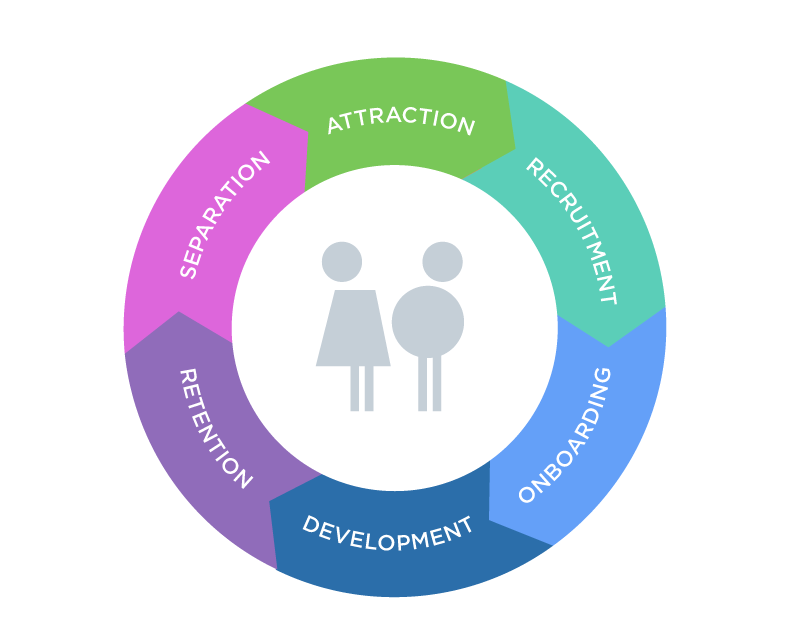 The stages are attraction, recruitment, onboarding, development, retention, and separation. The ELC does not equal employee experience, but rather is part of it. So use it as a template to assess key touchpoints, but always remember that employee experience is the responsibility of leaders and it is always present. Now that you are equipped with your new powerful allies, you can optimize and automate almost everything about the cycle, making your life and those of your employee’s easier. We’ve broken down the different stages of the ELC and given you some examples for you to get started right away. 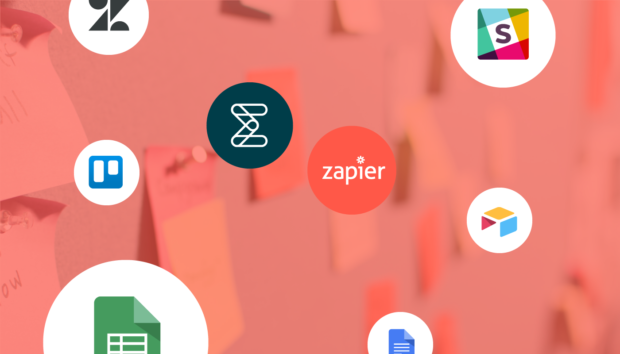 These are just a few examples of the millions of combinations you can make with Enalyzer, so if you’re app isn’t there, simply head over to Zapier to find more! When it comes to recruitment there are two groups you need to think about, employees in charge of the recruiting process and the new recruits. Did you know that on average, 250 resumes are sent for a corporate application? With Enalyzer, you can have applicants upload their resumes to your survey and have it all in one place. With Zapier, you can transfer their applications to a project management app and use your time selecting the right person for the job. 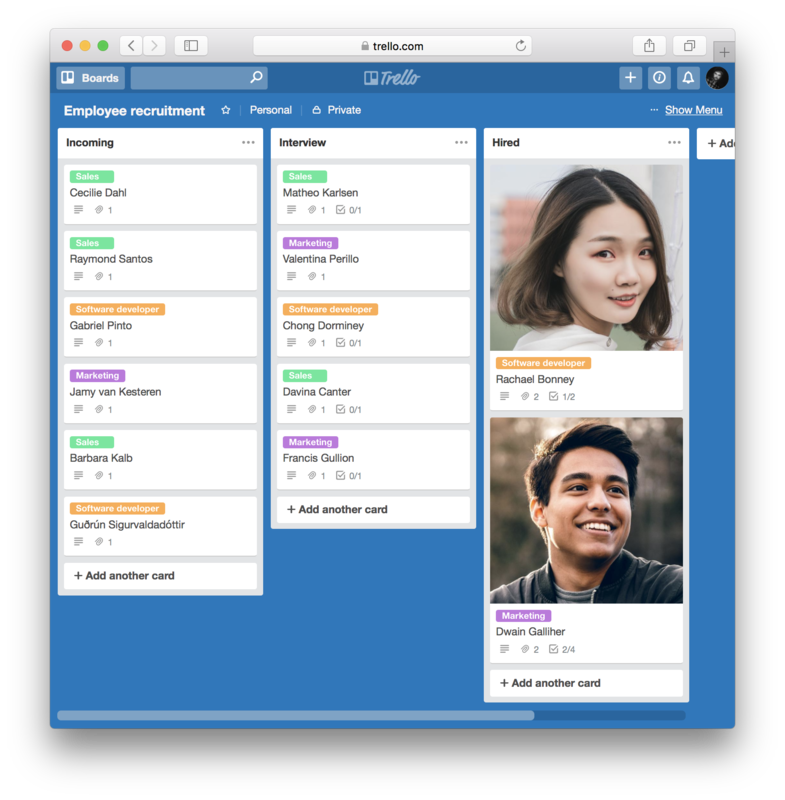 For example, by transferring your applications from Enalyzer to Trello via Zapier, you can create an easy-to-use recruitment board as seen below. We’ve all been there, there’s a great applicant but they’re not fit for the position and you make a mental note to write to them once a new position opens… but it never happens. Instead, collect all the emails addresses with Enalyzer and automatically add them to a mailing list using Zapier. Once a new position opens, let them know! Give them a warm welcome. Enalyzer is more than surveys, you can easily make an interactive welcome message that thanks to Zapier can be automatically sent to new hires once they’re added to your HR administration app. Employee onboarding should always be a focus, the faster you get them up to speed the quicker they can be a productive member of your organization. Plus, if you don’t have a plan for onboarding, you risk losing new employees. Remember: effective onboarding saves money and builds loyalty. It’s your first day and you get introduced to the entire office and somehow you’re not only supposed to remember their names and faces but also what they do… no pressure. Collect information from everyone at the office with a quick Enalyzer survey and transfer the information with Zapier to create a company directory that will massively reduce the awkward “what was her name again?” situations. With 76% of new hires feeling socialization is most important, this smart integration can easily increase engagement. How do you know if your onboarding program is working? By asking your employees. Create a pulse survey on the onboarding processes that you can send to new hires, do this at frequent intervals using this Zap, e.g. once every two weeks or once a month. Analyze your results and improve your program using Enalyzer’s reporting tool. Remember to also have face-to-face meetings with them based on the feedback they’ve provided. Showing your employees that you care and encourage their development can do wonders for their engagement and productivity since it boosts morale while gives them the tools to deliver. Enalyzer makes it easy to assess your team’s knowledge. By sending regular test surveys, you can analyze the data in Enalyzer and identify trends of areas that need improving. With Zapier, you can get an overview of their answers via email or a messaging app and keep a well-organized overview. Losing an employee is bad for business. Research consistently finds that employee retention is the key to maintaining know-how and increasing morale, customer satisfaction, and sales. Constantly measure morale and ask for employee feedback, since they need to know that not because they’re not new anymore they’re not appreciated. Build a pulse survey and analyze the feedback using Enalyzer. Zapier makes it easy to send pulse surveys regularly. Remember that retention needs action, so always follow-up! Employees leave and you have to accept that, but don’t let their knowledge leave with them. They may leave for a multitude of reasons, lack of advancement options, mismanagement, and general job dissatisfaction. Exit surveys give you the feedback you need to ensure current, valuable employees don’t leave. Use this Zap to send automatic exit surveys to those employees that are leaving the company. 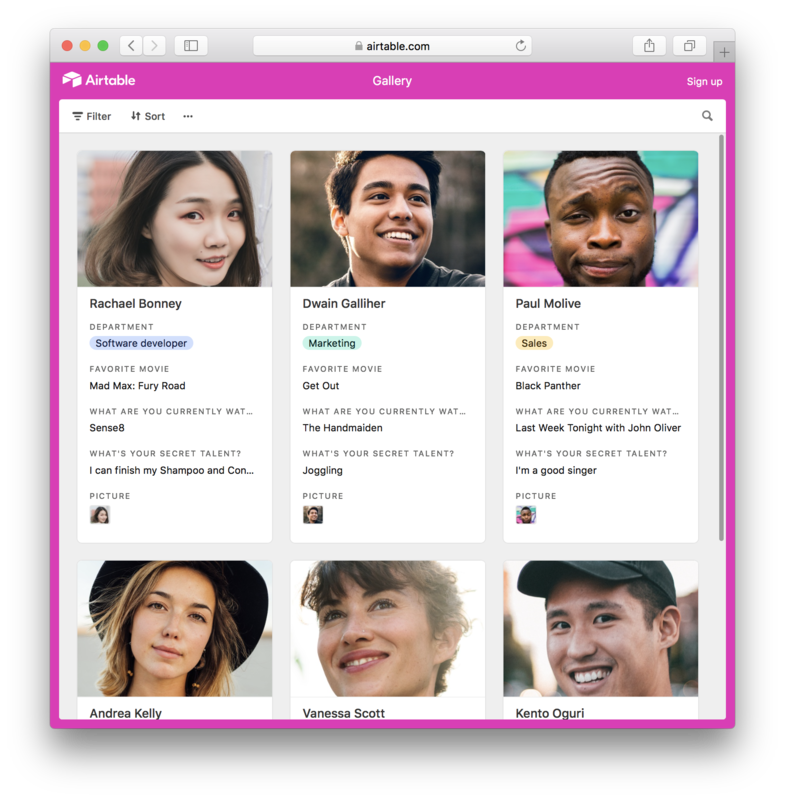 Use Enalyzer to analyze all the feedback you get and optimize the experience for current employees. Attraction is known as the first stage of the ELC, which is silly because the model is a circular process and not a linear one… but I digress. The attraction stage refers to the power your brand has to, funny enough, attract people. It doesn’t matter how great your product or service is, if you can’t attract talent you will fail over time. The attraction stage takes place all the time since it refers to your employer brand, which is being perceived as a great workplace by everyone, current and former employees, stakeholders, your neighbor – you get the picture. Implementing some, if not all, the aforementioned processes will contribute to your company’s employer brand. It will send an image to those inside and outside your company that you care for employees and their well-being. For example, if someone doesn’t get hired while you’re recruiting but gets a sense that her application was treated properly and professionally and even gets a email with open positions in the future, she will attach good feelings and opinions to your company. Generally, HR departments focus on issues such as engagement, career development, rewards, etc. separately. These programs have their own set of tools for measuring, monitoring and assessing. However, these different factors are all part of a bigger concept – employee experience. Employee experience sees all aspects of the employee’s satisfaction, engagement and wellness as being interconnected. But how did we get here? As with everything, the business world evolves and changes. Today, we are seeing a shift from organizational priorities towards a people-centric approach that puts emphasis on experiences. Decades ago, the relationship between employer and employee was straightforward. Employers needed employees and employees had bills to pay and certain skills to offer. Therefore, the focus was on functionality – the employee needed the adequate tools to carry out her work. Bringing up “out there” ideas such as flexible working arrangements would’ve gotten you laughed out the door. Don’t take our word for it, ask your grandparents. Employers moved on to focus on productivity, however, once technology came into the picture and started optimizing productivity, employers now found themselves focusing on engagement. This shift made the relationship between employer and employee a two-way street, and employers found themselves emphasizing on what the organizations could do for employers. Which brings up to today, where the buzz word is employee experience. Employees are unable to compartmentalize their experiences and therefore, their experience with your organization entails everything from culture to physical environments. → Want us to automate everything for you? Get in touch!